Choose a substrate of the desired end size. Plan ahead if you are thinking of framing this, and work in a standard size so that you can slip the piece right into an off-the-shelf frame. OPTIONAL: Paint the substrate one solid background color using the acrylic paint (in my example, the background was first painted teal). Brainstorm a list of your dogs' favorite commands/words. Using a different colored/patterned collage paper, cut out thought bubbles for each command. You can size/shape these however you wish. 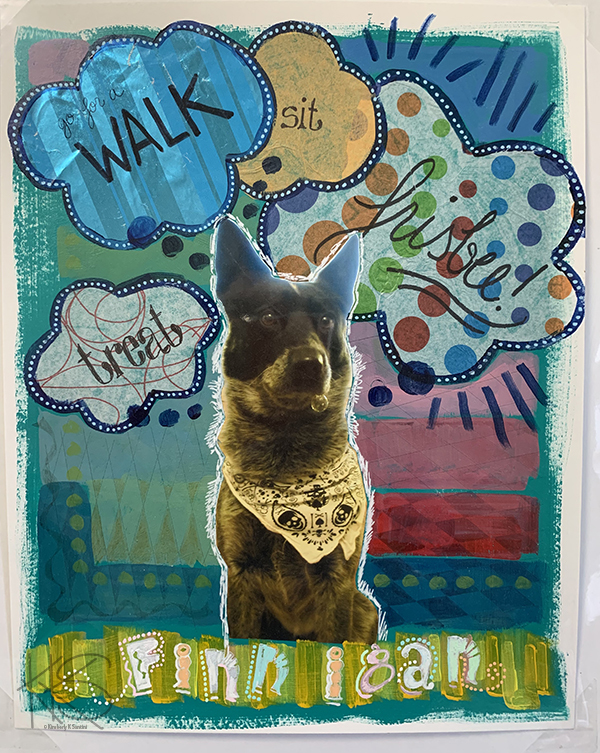 Cut out a banner/strip piece of collage paper to use for your dog's name. You can size/shape this however you wish. WITHOUT GLUE, play with the placement of your objects on the substrate. Experiment with overlapping the various shapes. Cut out/create new shapes as needed. Pay attention to the colors you are using as well as any patterning. Move things about until you have an interesting design. Use your phone to take a photo of the design. Glue your pieces into place. Refer to your phone as needed to recreate the placement of each piece. Add lettering to your thought bubbles. Vary your lettering for added interest. If you don't like your handwriting, use stamps or cut out letters from a magazine. In this example, the thought bubbles are lettered with a black sharpie, the dog's name with paint pens. Scribble a perimeter of color around your dog's silhouette. I used an opaque paint pen. Add decorative borders to your thought bubbles with paint pens/acrylic paints. Consider adding rays around the word/command that is his/her favorite, like I did with "frisbee"
Sign and date the piece - if you don't want to do this on the front, that's ok, put it on the back. Trust me, you'll be glad it's there down the road. Share you collages with me, either by commenting on the blog or adding them to the thread on Facebook. I'd love to see them, as would others!